Jonathon Green started working at the firm as a summer law clerk in 2015. 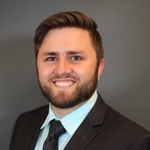 After graduation, the firm hired Mr. Green full-time as a law clerk in June 2016, and upon his admittance to the Alaska Bar in October 2016, as an associate attorney. Mr. Green previously worked as a law clerk with in-house counsel for a large international technology firm, as well as a mid-sized biofuel and petroleum company. Mr. Green speaks a variety of languages and his previous in-house work has involved contract issues and negotiations in English, French, Italian, Portuguese, and Spanish. Mr. Green’s work has included international and domestic shipping matters, multimedia corporations, utility regulation, mining operations, fuel transportation, and agricultural endeavors. Additionally Mr. Green has experience with a wide variety of employment law matters. Mr. Green received his Bachelor of Science degree in Economics in 2013, from Brigham Young University. In May 2016, he graduated law school from the University of Utah S.J. Quinney College of Law with honors in Environmental and Natural Resource law. Mr. Green was admitted to the bar in Alaska in 2016. In 2015, Mr. Green was awarded the Joe Rudd Scholarship from the Rocky Mountain Mineral Law Foundation for his dedication to practicing natural resource law in Alaska. He has published articles on topics including fisheries management conflicts, offshore hydrocarbon development, land use, and employment law.